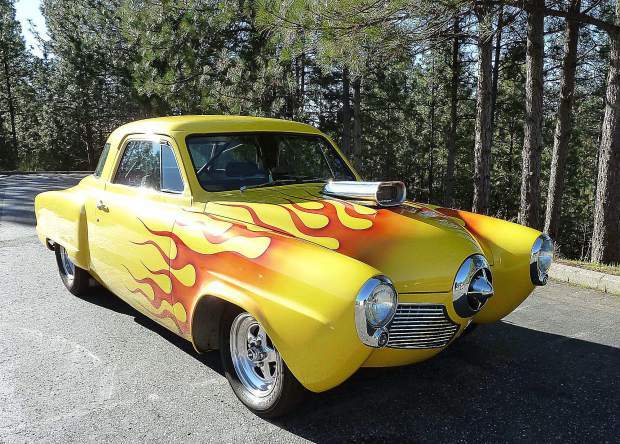 When Studebaker came out with the bullet-nose Starlight Champion coupe with the wrap-around rear window in 1950, the joke was “Which way is it going?” But it brought Studebaker its all-time highest sales years, so the public must have liked it. It is still one of the most recognizable automotive designs. When Danny Weger had the opportunity to buy a 1952 Studebaker Starlight coupe from his friend for $500 20 years ago, he decided to take it. He’d helped his friend do some work on it, but the friend decided to sell it. It was a body with no front clip and no engine and trans. He’d helped put in a Mustang II-type front end with rack and pinion steering and tubbing (cutting rear wheel wells into the trunk for bigger tires), but there was a lot of work yet to be done. He planned to do it “on the cheap,” so he could sell it for a nice profit. First thing he did was to locate a ’52 Commander front end in Winnemucca that he bought, but didn’t like the nose. So he found a “bullet nose” from a ’50 Commander and put it on. Then he removed all the emblems and filled the holes, then welded the rear fenders to the body. To get an aggressive look, he didn’t put on a front bumper and pulled off the rear one, using a rolled pan in place of it. “From there I did a ground up,” he said. He rebuilt and narrowed the Ford 9 inch 3.70:1 rearend so that he could run 18 inch wide rear tires. For power, he ran a Chevy 350 cubic inch engine with a B&M blower mated to a Turbo 350 auto trans, moving the engine on the frame to balance properly. Exhaust ran through headers to a pair of Flowmasters before dumping just in front of the rear wheels. “I can’t get the exhaust over the rearend because there’s no room,” he said. Inside, he kept to the basic drag car theme, using aluminum door panels, race gauges with a tach and a Hurst shifter. A pair of ’80s Mustang buckets provided comfortable seating. For effect, he added a four-point roll cage inside. Everything was minimalistic. He did all the mechanical, body and paint himself, working it around his regular job. There was only one problem. He fell in love with the Studebaker. Since then, Danny has kept improving his Studie. For years, he owned Bear River Auto Body, which gave him a place to get his work done. He did a complete paint job with flames laid out by his son. He put in all new glass, except for the irreplaceable curved rear windows. However, he did replace the rubber around them, finding it from a Studebaker parts supplier in L.A.
“You can buy a lot for Studebakers now,” he said. However, when the radio went on the fritz, he didn’t replace it, preferring the music of the thumping engine. He changed to a Weiand blower. One major change wasn’t voluntary. The new engine is also a 350, but with aluminum heads and roller rockers and a high lift, short duration blower cam. With a pair of Edelbrock 500 cubic feet per minute carbs, it put out 430 horsepower without the blower! With the blower it could easily hit 500 horsepower. While the Studie may be inspired by a drag car, with no luxuries like power steering, power brakes or air conditioning. Danny doesn’t race it. “I built it for fun, not drag racing,” he said. He’s even keeping the non-posi rearend. “It keeps me from breaking things,” he said. One non-drag car change may be in the offing: power steering. “I’m tired of armstrong steering,” he said with a chuckle. In the meanwhile, he’ll keep taking it to shows and hot rod gatherings in NorCal and Nevada, enjoying driving his studly Studie. Ron Cherry’s books, including the Morg Mahoney detective series, are available on Kindle and in print copy at Amazon. His new book, “The St. Christopher Murders,” is a Fourth of July mystery that takes place in a small town in the Sierra Foothills that is remarkably similar to Nevada City and is now out in paperback and Kindle on Amazon. Check out his website at http://www.rlcherry.com.